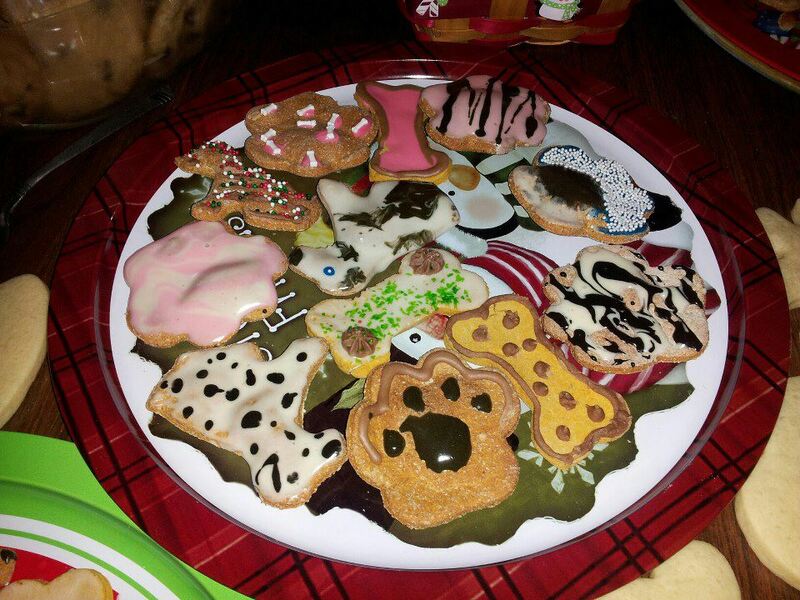 Use royal icing for dogs to decorate dog treats. This type of icing, when used for baking for humans, is a hard white icing made from beaten egg whites and powdered sugar. It is typically used to coat wedding cakes and Christmas cakes because it dries hard and smooth. 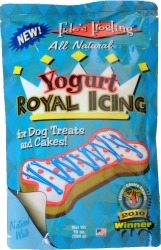 We have found a dog treat icing made from all natural yogurt. It does not contain eggs or sugar. This makes it a relatively safer product to use for icing dog treats. You do not have to worry about salmonella from raw eggs, nor added sugar for dogs that should not have any. This all natural icing for dogs is called "Fido's" and can be ordered through the dog bakery supplies company K9Cakery.com. in that it is more flowing in its nature. This makes it easier to decorate dog treats and dog cakes with intricate designs. Fido's will dry hard and will not melt in warm temperature. You just add a specified amount of water and stir. You can even mix in colored icing gel to get the desired hue for your project. You can use it on dog biscuits. When choosing a dog treat icing, make sure you check the ingredients. There are some icing mixes available on the market that catch your eye by claiming they are sugar free. But if you check the ingredients very closely, you will find they contain flour and eggs. This is important if your dog has an egg allergy or an issue with flour. Find Fido's Yogurt Icing for dogs. More about dog treat frosting - find out the difference between dog treat frosting and dog treat icing! Pros and cons about yogurt chips - yogurt chips are used by many bakeries. Read why they are no longer considered a healthy alternative by dog bakeries.